A silicone based polymer, dimethicone acts as a skin conditioning agent to slow water loss from the skin by forming a barrier on the skin’s surface. Dimethicone is also well known for its flow properties, which enhance the smooth application of personal care products. Acts as a skin conditioning emollient that binds water to help keep the skin hydrated, helps keep the skin looking soft and smooth, and imparts a shine to the skin. Created exclusively for Motives, this makeup collection contains must-have items that will help you achieve the looks created for Scott Barnes's celebrity clients. Four lip glosses, four eye shadows, two shades of blush, four shades of concealer for contouring and one translucent powder are all stacked in a convenient little box. The Present by Scott Barnes for Motives is perfect for traveling and can take you from day to night with ease. 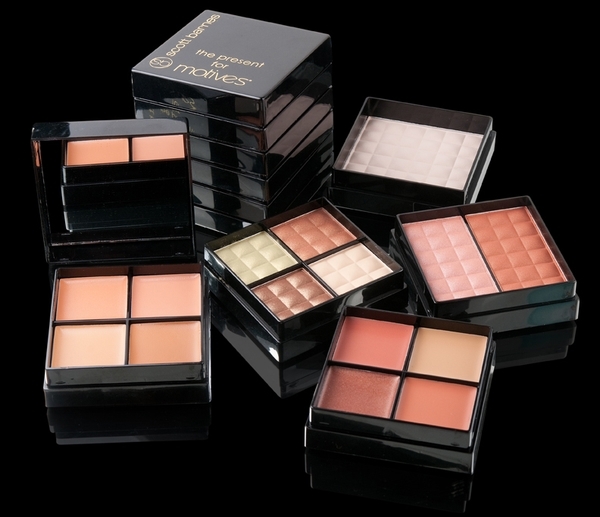 How many colors does The Present by Scott Barnes for Motives® come in? The Present by Scott Barnes for Motives comes in two different sets of colors: Smokey Nights and Golden Goddess. Smokey Nights contains darker shades of eye shadow to contour the eye and add definition for a smokey look. The blush and lipstick shades are complementary to the eye shadows to create the perfect overall look for an evening out. Golden Goddess contains brown and gold colors to create a great neutral look and still maintain definition in the eye. The blush and lipstick shades are also complementary to the eye shadows to complete a beautiful daytime look. What is included in The Present by Scott Barnes for Motives®? Four lip glosses, four eye shadows, two shades of blush, four shades of concealer and one translucent powder are all stacked in a convenient little box. Can I purchase The Present by Scott Barnes for Motives® only through Motives? Yes, The Present is created exclusively for Motives and may only be purchased through Motives. Is The Present by Scott Barnes for Motives® convenient for traveling? Yes, The Present by Scott Barnes for Motives is perfect for travelling. Each section of the box contains a necessary essential to complete the face. The sections stack one on top of the other and secure into place so the product stays protected in your purse or bag.